Concentrated temperature management system for soldering. A great quality improvement and reduction in costs will be achieved by adopting the basic technique of LA method and systematization by computer. "Tendency management" will produce high quality by reducing defects, rather than following after defects as in conventional quality control. *The 220V specification of TB-150 is 40W. Controller with telecommunication facility, improvements added to make the best use of LA method. Accurate temperature of solder iron tip is always displayed by the function to correct the temperature display of standard thermometer and the panel. Setting temperature of soldering iron tip and load temperature are always displayed on digital panel, and process temperature is controlled by this display and by alarm sound system for limit temperature. An ideal parameter value can be automatically set by auto tuning function, though PID control is adopted to keep the iron tip temperature variation minimum. For specification of M50/MW50, please refer to this page . 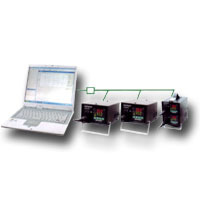 *PID control is a combined control of proportion operation, integration operation, and differentiation operation. It is a high-level control, which gives a smooth control without hunting by proportion operation, corrects the offset automatically by integration operation, and responds quickly to turbulence by differentiation operation. Increasing the soldering level The condition for the best soldering can be found by analyzing the temperature correlation of soldering iron and the object. Maintenance of high quality Defective goods are held off at the edge of water by alarm function. Clarification of cause and measures The work record can be investigated in case defective goods are found. Expanding order by high quality. Submitting objective work record to customers, always and at any time, will create great trust. Decreasing costs greatly Temperature management of solder iron tip by PC wil shorten the check time greatly. Harmonious with basic philosophy of ISO Consistent process temperature management from flow/re-flow in the former process to the present process becomes possible. Display the accurate temperature situation of LA method solderting iron tip by PC. Moreover, temperature can be displayed in numerical value and line chart as shown in the above figure. When the temperature of soldering iron tip becomes abnormal (too high / too low), it is displayed on PC, with alarm sound. Setting temperature and parameter setting of soldering iron tip can be done from PC. The imported temperature data can be saved in hard disk of PC, and be processed by spreadsheets, such as Excel etc. Logging function Temperature of soldering iron tip is measured at every optional time, and is saved as data. Because the temperature of all soldering irons can be measured instantly, every day temperature measurement is simplified, and the total cost will be reduced. It also complies with external audits and the examination of ISO very well. Alarm history function When the temperature of soldering iron tip becomes abnormal (too high / too low), it is diplayed on PC, and the history is preserved. By checking this data, it is possible to recognize and detect products with the danger of unsoldering. Abnormal outbreak time, the operators and the stateof abnormality can be checked. Analysis mode In this mode, data of 5 connected soldering irons are analyzed in high resolution of once every 0.3 seconds. Moreover, thermo-couple (option) can be used instead of solder iron, to measure the temperature of the object.